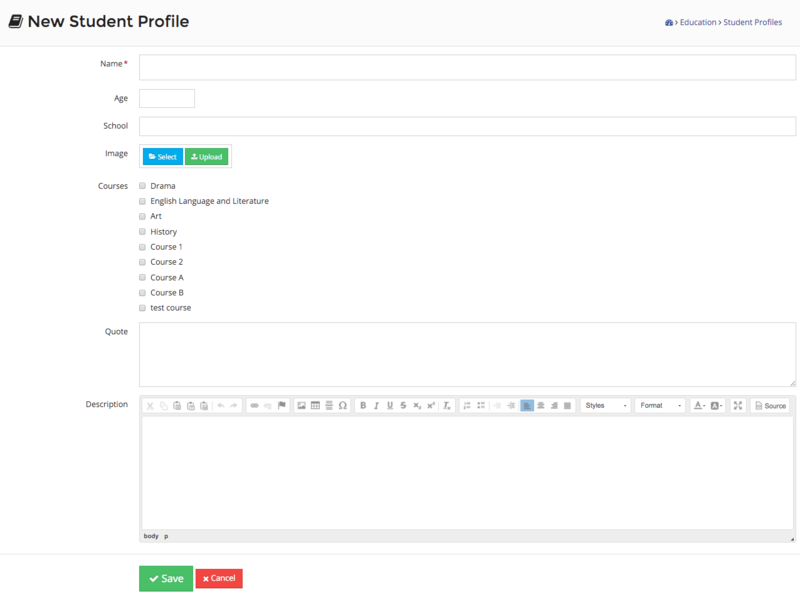 A student profile can really enhance the quality of an individual course page. A student profile contains the photo and quote from a student which can then be a great advert for the course. Student Profiles can be found under the School > Student Profiles menu. On the Student Profile page, any previously added profiles will be listed. To add a new Student Profile click the green "+ Add New’ button at the top of the page. Below is an explanation of the fields on the Student Profile details page. The name of the student as it will appear on the website. The age of the student. The previous school the student attended. This image is the student's image that will be displayed alongside their quote on the relevant course page. The list of courses added to the website will all be displayed here. Select the relevant course(s) for the quote to appear on. A description that you can add about the profile for your reference. This button saves the profile and it will then be displayed on the relevant course page(s).